Every day, you are doing the best you can to take care of your family and balance a myriad of tasks. Every day, there are moments of unmatched joy. And every day, there are moments that you're wondering if you are succeeding at all. Becoming a mum is one of the most special experiences in life. But in some ways, it might be causing you to freak out just a little bit as you navigate a whole new season of life without a road map. At Coaching Mum, I work with women like you who are finding the experiences of motherhood wonderful but confusing. I help mums to create a vision for motherhood that outlines the values for themselves and their family, and work through areas that are causing 'mummy guilt'. Together we investigate the struggles that you might be having with your mindset and negative self-talk, and create a clear picture of how you can become the mum you want to be. I want you to live in this season of having young children feeling confident, capable and fulfilled, because you are amazing. Hi, I'm Tanya, thanks for being here! 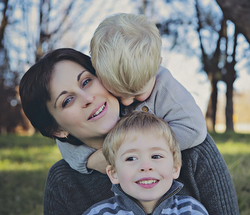 I am the mum of two boys, and I love to empower and equip women to live purposefully. If you would like to find out a bit more about the coaching I offer, please click here.